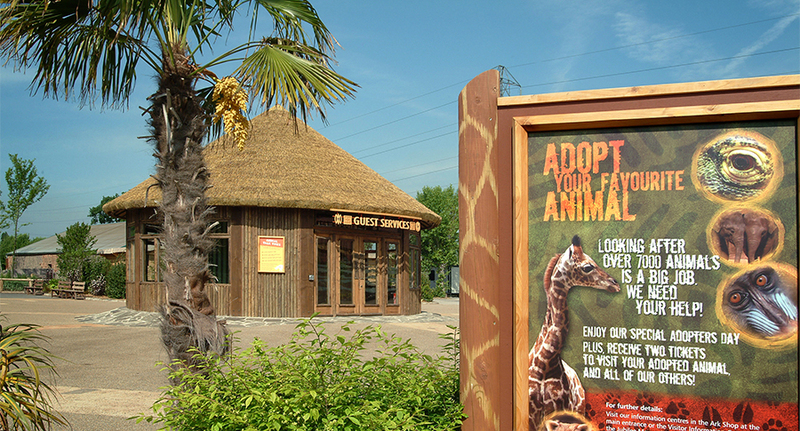 To adhere to existing technical plans and work alongside other contractors to erect a “Guest Services” building at the front entrance to the zoo. 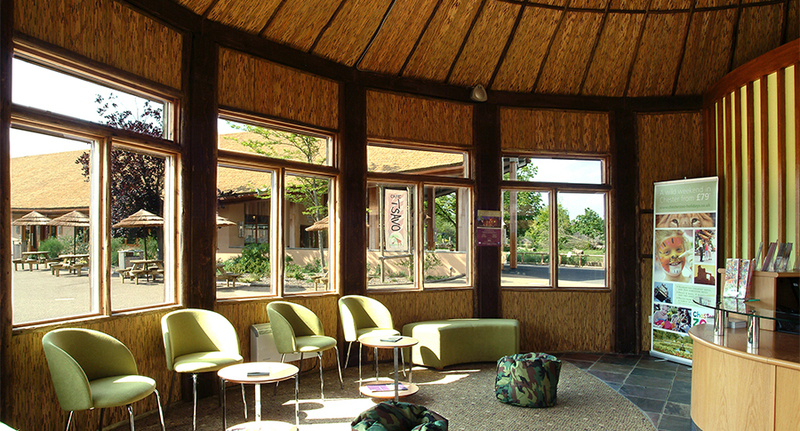 The building had to be aesthetically in-keeping with the tropical look of the zoo and needed to be suitable as a staffed information point, a comfortable visitor reception area and to house technical equipment. A maintenance free, long-life thatch roof was required. Time was restricted to a 3.5 week build timetable. The circular building measured 10m in diameter and the walls were constructed from robust Redwood posts, with a Scandanavian Redwood frame covered in exterior plywood to which a water proof membrane was attached. Half-round eucalyptus clad the outside of the building which gave a rustic, tropical feel. The windows were double glazed with opening top casements and the doors were electronically controlled. The roof trusses were constructed from Scandanavian Redwood, which were clad on the outside with exterior ply and felted to ensure the building was waterproof. Finally, polyolefin thatch tiles were stapled to the exterior with the addition of a 150mm eave tile, giving the appearance of a natural, dense thatch roof. The polyolefin tiles have a life expectancy of over fifty years and require no maintenance. The inside walls were insulated and clad with Cape Reed boards and half-round eucalyptus. Insulation was applied to the inside of the roof which was then clad in Cape Reed boards, and half-round eucalyptus disguised the joins between the boards, creating a pleasing feature. The project was completed on budget and on time.